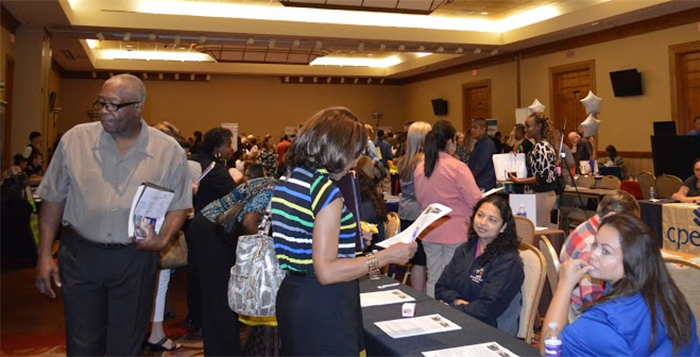 Over 350 Maricopa residents attended Arizona Workforce Connection’s job fair at Harrah’s Ak-Chin Wednesday. In total, 52 vendors showed up to talk with Maricopa residents in need of jobs. The ballroom was nearly filled wall to wall with employers and prospective employees, and the line to attend nearly reached the casino floor. Local job hunters put on their best attire and brought their resumes. Companies and organizations from many facets of business set up tables for the event. Maricopa Unified School District, Maricopa Police Department, the U.S. Border Patrol, Walmart and Lowe’s were among the vendors, but each offered unique opportunities for members of the community in need of work. According to Arizona Workforce Connection business service liaison Linda Martinez, the job fair turned out exactly as they had hoped. When the job fair first came about, Martinez hoped to get 40 employers interested in attending. The 52 that showed up pushed the first AWC event in Maricopa well beyond expectations for the community.